What if we recognized a deep connection between faith and business? What if biblical values weren't roadblocks but actually the source of successful business? What if the real goal of business were more noble than profit maximization? What if we could see our everyday work as having spiritual value? What if we could approach it as ministry and our calling? What if God cared deeply about our work and wanted to be involved? And what if we could even partner with him in our business? Learn why Christian business people are uniquely equipped to address poverty, a disease that afflicts many millions around the world. . Kingdom business is business pursued with a goal of achieving spiritual, economic and social transformation in individuals and nations. How do we resolve the tension between work and spiritual life? Many of us separate our work and faith into compartments, but that disintegration leaves us unfulfilled. 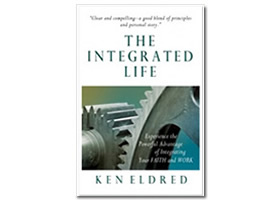 As Ken Eldred describes in his book The Integrated Life, compartmentalization results from erroneous messages from both business and church. In reality, our spiritual lives and work lives share a common goal and can be deeply integrated. We need to adopt a new paradigm of work that views it as a calling and sacred ministry. Kingdom business is for-profit ventures pursued with a goal of achieving spiritual, economic, and social transformation in underdeveloped nations. Sometimes called business as mission, it is a simultaneous pursuit of several factors, including successful business, work-faith integration, economic development, job creation, and promotion of the local church. 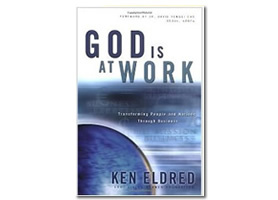 A more thorough description of kingdom business principles and practices may be found in Ken Eldred's book God Is at Work, named the top book in the field by the Business as Mission Network. "Business as mission pursues profit for the sake of growth and sustainability: it is only by pursuing and promoting real for-profit business ventures that BAM can facilitate the holistic transformation of individuals, organizations and nations, which is part of the Great Commission mandate. In this case, business becomes a mission tool for ministering to those with real needs -- through local job and wealth creation, education and basic healthcare, and church growth."